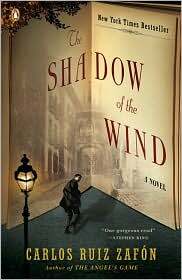 Before he created the haunting tale of The Shadow of the Wind – one of my favorite books; I’m still looking for the Cemetery of Lost Books – Carlos Ruiz Zafón wrote young adult literature. 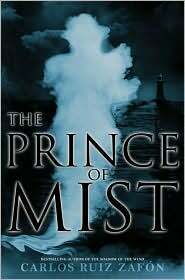 In his author’s note, Zafon reveals that The Prince of Mist was his first published book. Using familiar themes: good vs evil, be careful what you wish for, be faithful to your friends, and whatever you do, don’t make a deal with the devil – Zafón compels the story into fantasy, with a convincing dose of realism. In The Prince of Mist, Max and his sister, Alicia, meet a new friend, Roland, when they move to a beach front house to escape the war that threatens the city. The house holds old secrets and hidden threats; together the friends face off against an evil character in a wild adventure with clocks running backwards and old sunken ships with skeletons. The underwater scenes will have you holding your breath. A fellow Zafón fan told me about the book – a quick easy read before she settled into another of Zafón’s longer new publications – The Angel’s Game. Zafón is an author who always delivers magic with exciting adventure. This entry was posted in authors, book review, books, children's books, children's literature, mysteries, places to go, reading, young adult lit and tagged Book, Carlos Ruiz Zafón, Prince of Mist, Shadow of the Wind, The Angel's Game, young adult fiction. Bookmark the permalink.